Filson Fishing Pack. 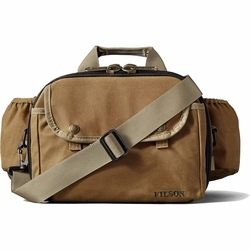 Filson worked with fly-fishing guides to develop the ideal on-river companion. The Fishing Pack is outfitted with a fold-out work surface to hold and repair flies and internal pockets for tools and essentials. External side pockets are perfect for bottles of water or sunglasses. Outfitted with quick-drying nylon straps at the waist and neck for multiple carrying options.